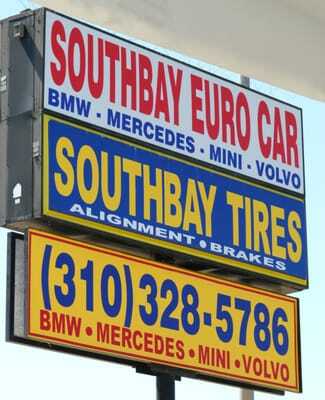 I've been taking my cars (MB C55 AMG, MB S55 AMG, and BMW 540i Dinan 3) to South Bay Euro Car (15+ years in business) in Torrance for a year now and I thought I'd provide a shop recommendation for some of the folks here from SoCal. So far I've done (1) alignments, (3) tire changes, (4) oil changes, (2) brake jobs, replaced a secondary air pump, and a few other things and I've had nothing but top notch service and attention to detail here. Pricing is much less than what dealerships charge but don't expect to get "hooked up" here since they've got over 30 years experience in the industry and that doesn't come cheap. If you do decide to take your car I highly recommend you call in and make an appointment and expect the car to be there for a minimum of half a day. His shop gets quite a bit of traffic and the shop has got six full time employees. They work on BMW, Mercedes, Mini, and Volvo and they pretty much have every tool needed to work on the car. Give them a call and ask for Maheeda (owner) and tell him Amer sent you. He'll definitely take care of you and your ride (like they have mine). Maheeda and his shop are looking to add another person to their team. They are looking for a mechanic with Euro experience, give him a call and let him know Amer sent you.